his is a country with real potential and an increasing number of stylish modern whites and rich plummy reds are now being made as well as a few established classics like the sweet Muscats from the island of Samos. Arguably nowhere has advanced the winemaking revolution here more than in the Peloponnese (Peloponessos), a cradle of ancient viticulture but until recently best known for a tradition of sweet wines (from Muscat and Mavrodaphne) under the Patras appellation. 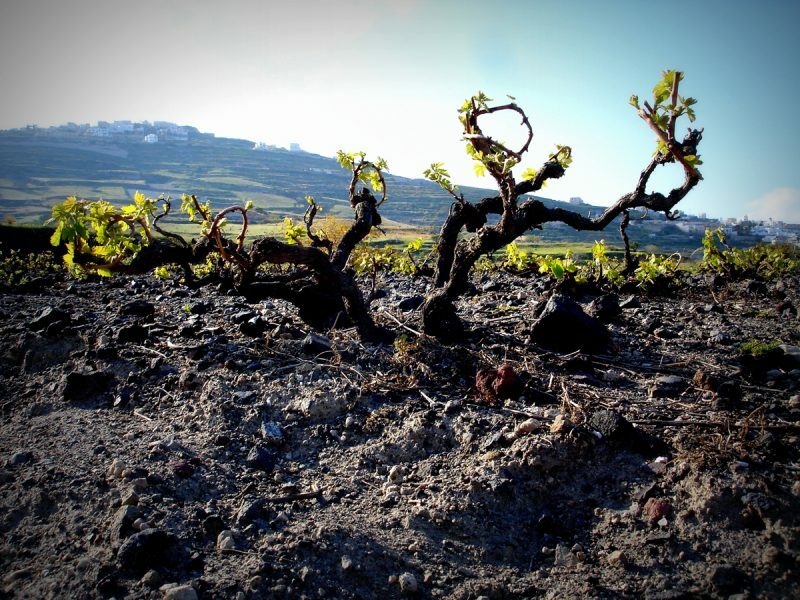 Independent producers are now exploiting more high-potential viticultural sites planted chiefly to Agiorgitiko for red. 100% of the variety is required to qualify for the leading red wine appellation Nemea while a minimum of 85% of the white Moschofilero is mandatory in the Mantinia appellation. The peninsula’s leader is Gaia Estate. Other good producers, including Skouras and Antonopoulos, addtionally promote international varieties. The same is true of the dynamic Evharis estate located east of isthmus of Corinth just outside Athens in the foothills of the Gerania mountains. Several new pockets of quality have also emerged in northern Greece. In the elevated lake district around Amydeon the Greek varieties of Xinomavro and Mavrodaphne are shown as much respect by Alpha Estate as imported Sauvignon, Syrah or Merlot. Further east, Gerovassiliou have put Thessaloniki firmly on the wine map with impressive varietals from French grapes but have also successfully revived the ancient Malagousia variety (as a varietal white) as well as indigenous black grapes (including Limnio) for a premium red blend. Further east is Biblia Chora on the slopes of Mount Pangeon (of Dionysus legend), succeeding as much with Agiorgitiko and Assyrtiko (the latter being combined with Sauvignon) as Cabernet or Chardonnay. A similar duality is echoed in the wines of Ktima Pavlidis, located north of here near Drama. Another part of Greece that has made huge strides is the beautiful volcanic island of Santorini. The potential for outstanding mineral-imbued dry whites from Assyrtiko has already been realized by Hatzidakis, Gaia estate and Sigalas. The quality of Vinsanto from dried grapes shouldn’t be ignored either. Also in a sweet wine vein are the famous Muscats of Samos. Here the island co-op continues its long and consistent production that combines quality and value.